Difference between revisions of "Ancient Graffiti Project"
The goal of the project is to include graffiti from both Herculanum and Pompeii, but at the moment most inscriptions come from the former, while only one block from Pompeii is currently included (''Regio'' I, ''Insula'' 8). The goal of the project is to include graffiti from both Herculaneum and Pompeii, but at the moment most inscriptions come from the former, while only one block from Pompeii is currently included (''Regio'' I, ''Insula'' 8). 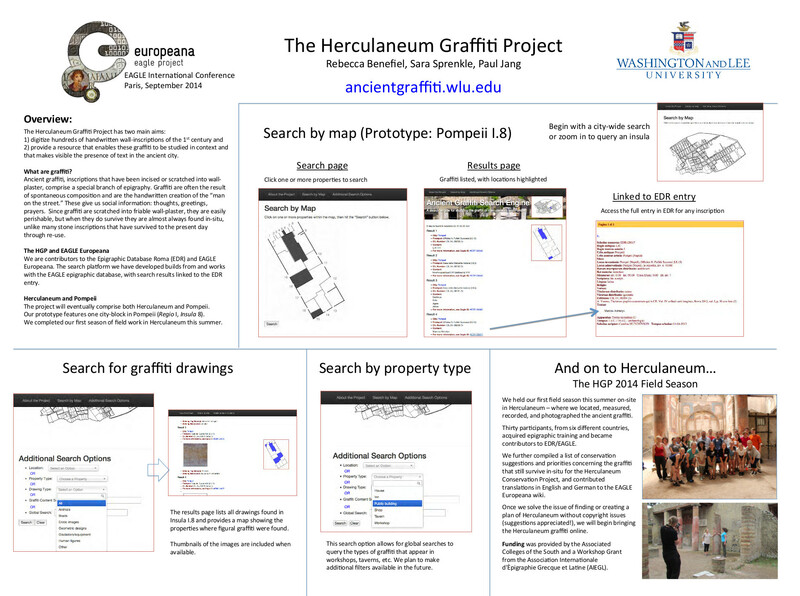 R. Benefiel, S. Sprenkle, P. Jang, The Herculaneum Graffiti Project, a poster presented at the EAGLE International Conference Paris, September 2004.